At the end of one of the most divisive, fraught and at times ugly, political battles of recent years, Election Day 2016 is finally here. Whatever the outcome, the race to be the 45th President of the United States has been momentous. Barack Obama used his digital savvy to great effect during his two terms. With both Hillary Clinton and Donald Trump borrowing a page from his playbook, who is the winner in search as millions of Americans go to the polls to cast their vote? From the minute the starting pistol went off on the 2016 presidential race, Donald Trump has enjoyed the lion’s share of search. The above Google Trends timeline shows a much larger proliferation of red than blue for much of the campaign, though it has become closer as polling day has neared. A quick glance at the above might suggest that Trump had the ear of searches but, there is no measurement of sentiment and a large volume of search does not necessarily mean a lead in the polls. A closer look at some of the peaks and troughs shows that the heat points tie in with key moments in the campaign, from debates to video leaks. What we can say after looking at the search trends, is that Trump sent more voters to their keyboards and to Google as the battle for the White House heated up. The last seven days have been much closer, with Hillary Clinton taking a slight lead. 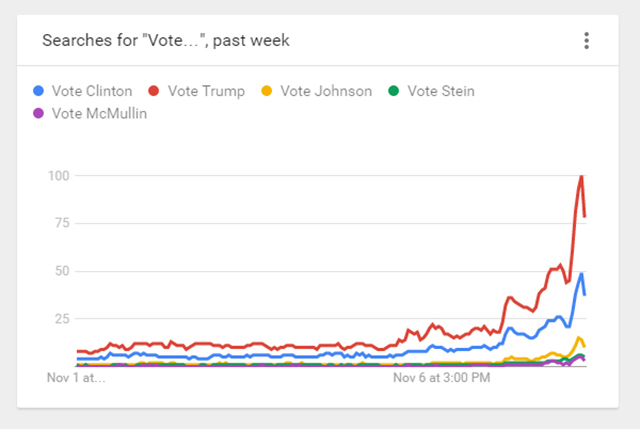 Trump made a comeback on the 6th of November with a huge leap in search volume. As the week’s run-up to Election Day closes, the two candidates are pretty much neck and neck for search volume. What’s important with these figures again is context – the two candidates appear to be sharing a similar volume of searches but interestingly, the most popular searches didn’t actually relate to policy or positions on key issues. As you might expect, many of the top search terms in the last 7 days related to the FBI and the Clinton email investigation – though even the announcement of no further action didn’t provoke a spike in searches for Hillary Clinton as you might expect. The timing of the FBI statement did however coincide with a leap in the number of searches being conducted for Donald Trump – perhaps from voters eager to see what his reaction would be, or from interest after he was rushed off stage after a ‘gun’ threat? *Breakout means the search grew more than 5000% in popularity in the specified term. The numbered figures represent the percentage increase of the search term in the period. For the most part, the majority of traffic has been focused on very general searches, with no demonstrable interest in leads, polling or policy. This is surprising given that millions of Americans will head to the polls today. However, this casual interest has shifted somewhat with breakout searches which have started to hone in on specific states such as Philadelphia. Other searches focus on celebrity support, showing the entertainment factor is still going strong even when the time comes to cast a vote. The emerging Donald Trump search terms on Election Day paint a different picture – there’s a lot more interest in who might win, who’s winning in the polls, if he has a chance to win, how many votes he has and other concerns that you’d expect to see with a large share of search on the day itself. Having said that, there’s still lots of interest on news stories – a trend which we’ve seen throughout the lead up to the big day. So who’s winning the search battle? 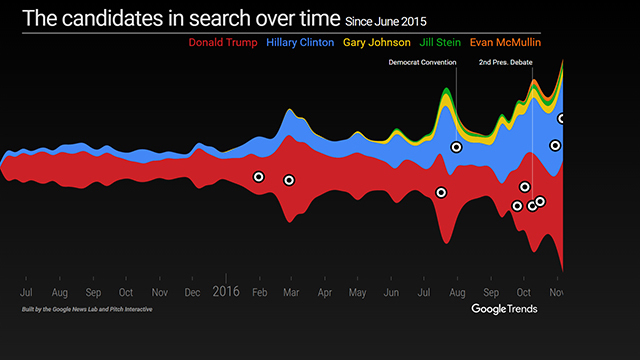 The search battle suggests that Trump is ahead, with a larger share of search volume, and momentum which he’s managed to retain through much of the last year. This is borne out by the data for a simple ‘Vote for + candidate name’ search – where Trump is the clear winner with double the search volume. Can we expect to see President Trump tomorrow? The New York Times reports that in the States where the likely victor has changed most in the last two wins, the gains have all been for Trump’s campaign – this backs up the larger search activity. However, overall it forecasts that the chances of a Madam President for the first time in US history sit at 84%.